All of the scripts were designed with the idea of streamlining my work in 3ds max by keeping me in my art brain. Some of the simplest tools, like the Match Tool, Pivot Tool and the Mat/Smooth, are my most used. These are tools that are designed to work quickly without diddling spinners. The Mirror Tool and the Zipper tool allow me to quickly stitch half of a character model together effortlessly. I use Model Diag and Object Cleaner with almost every object I build to make sure the geometry is clean. I use Nubbins for small project-specific scripts I write and also to launch my favorite maxscripts from ScriptSpot. After years of littering my desktop with reference art while I worked, I now use Imagebar to organize and keep all of my reference art instantly available, right inside of max, in a way that doesn't crowd my workspace with a bunch of windows. Good luck. Hope you enjoy these and find them useful. What does the name mean? Popular in the mid twentieth century, Automats were self-serve cafeterias that sold dishes from coin-operated bins. Customers would build their own meal a nickel at a time. That was the inspiration for the interface. The goal was to keep a small footprint for the tool but allow the user to pick and choose which parts of the script to keep open at any given time. The Nubbins tool expands this idea because it allows the user to create an interface of sorts from any collection of maxscripts. **Like any mzp install script, make sure you are running max in Administrator mode when trying to install the package. Submitted by Derp Meowslurp on Tue, 2014-04-01 15:45. Are these tools broken up so we can assing them to our own hotkeys and toolbars? or do we have to use the ones shown? Submitted by luxxeon on Tue, 2014-04-01 14:39. This looks very interesting, and right up my alley. Thanks, I'll try it out. My only question is the purpose of the "mirror" and "zipper" tools, when Symmetry modifier does exactly the same thing, automatically? Submitted by bathyscaph on Tue, 2014-04-01 12:51. 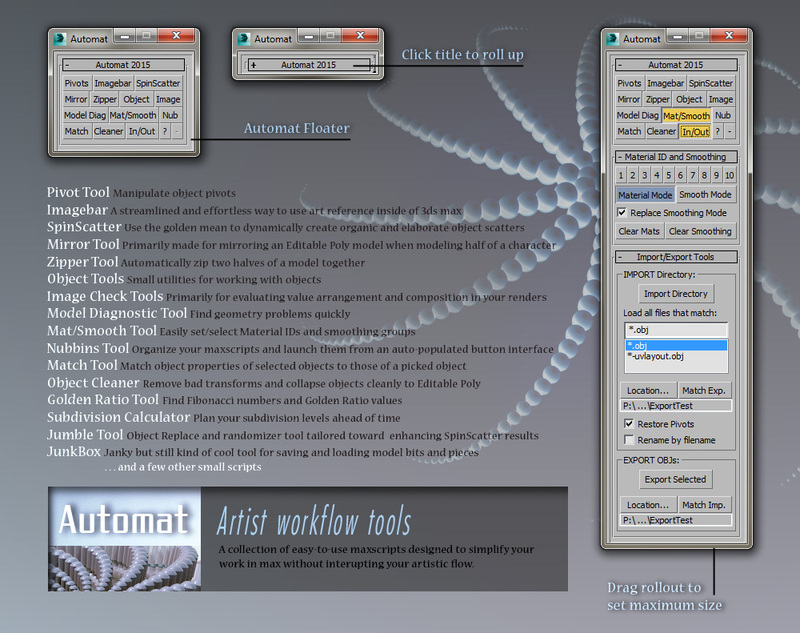 Added additional options to Jumble Tool.